The wedding season is here, and if you are facing the budget crunch with your decorator, then I have some quick and affordable DIY ribbon wedding decor just for you. While the world might go ahead with designer wedding outfits, pinterest worthy decor etc etc, reality doesn’t really work that way for most of us. But that shouldn’t deter any of us from having a fabulous wedding. 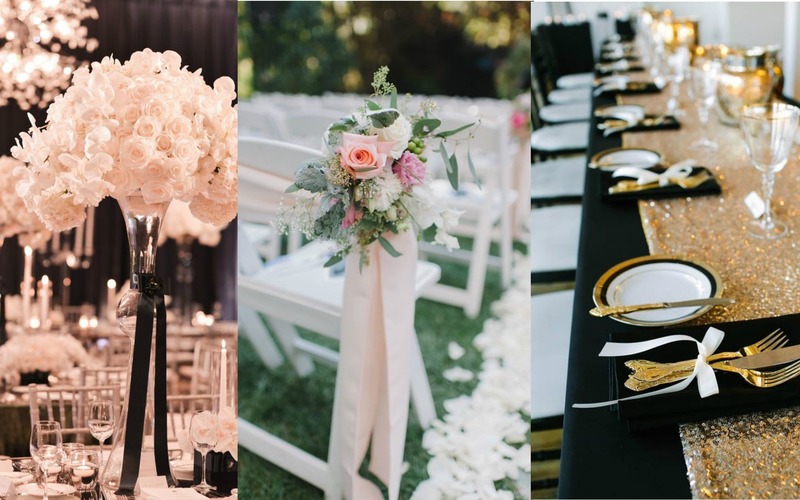 If you have missed out on my other DIY Wedding Decor options, the list is here. I wanted to continue with this series because there are so many options out there. There is no need to panic every time a decorator adds an extra zero at the mere mention of props. Given the time and effort these props require, you can pretty much have a figure in mind rather than blindly paying exorbitant amounts. Today’s post is going to be all about ribbons. They are something we all have used in our childhood from tying our hair, to doing mini DIY projects at home. Easily available at stationary store, these come in a range of colors in satin fabric giving it a rich look feel, and they are not expensive. The important part. Isn’t this just gorgeous! I love love this idea. The only challenge here is to manage and get those bamboo sticks or some stick that will help keep the ribbons in place. Nevertheless, this photo booth section is super duper unique and the best part is you can totally match the colors with your wedding theme. One of the most popular wedding decor idea, this ribbon wedding decor can easily turn any boring chair and add the right personality to it. If you want to go the extra step with your decor and theme, this is the perfect addition to it. Ribbons look great as is, so even if you don’t wish to put in the money on flowers, just go with a bow style look…and you will still get yourself a fabulous decor theme. The only time I would recommend this decor idea, is if you have a simple beach type wedding without much fuss. Coz lets face it, in a full blown Indian Wedding theme this would just not work ! The raw material for this project will hardly cost you anything. All you got to do is get your decorator/caterer to agree to do this for you (for a nominal charge ofcourse). Bold color or pastel shade ribbon, which one do you prefer? A super cute idea, rather than going for the invisible nylon lines, this will add that perfect dimension to your decor theme. You can hang pretty much anything from the ribbon from candles, flowers, bird cages…anything that you wish for. Don’t be too lost with the word wreath…I didn’t know it was called that either. I had to google it 😀 Its a very christmas thing to do, but hey, if you can come up with something like this…then its going to look fantastic in your mehendi decor. If you have a nice corner or a wall or section that you wish to emphasize, then adding ribbons is the perfect pick for you. To add the oomph to the decor, just add a single rose at the end, and its going to pretty much look as good as any other pinterest wedding decor. Too cute no? Totally bookmark worthy. Just get some of your bffs to help you out with this on a free weekend.